I spent a great day with Rotarians in the San Gabriel Valley. I began at a fine breakfast with the Rotary Club of Walnut Valley. We met in San Dimas, and the group was friendly and engaging. Kudos to president Peter Pirritano for his professionalism and kind way he conducts his meeting. Each program would open with a greeting from the hostess and the Pledge of Allegiance. Then, she and her group of children would embark on 30 to 60 minutes of games, exercises, songs and moral lessons, which were regularly accompanied by background music. The young cast was rotated every two months, and ranged from four to five years old. Romper Room tried to teach its young charges to be polite. For instance, the hostesses were always addressed as Miss. Many of the hostesses had prior experience in working with small children, as many were former kindergarten teachers. A recurring character was Mr. Do-Bee, an oversized bumblebee who came to teach the children how to be well-behaved; he was noted for always starting his sentence with Do Bee, as in the imperative for example, Do Bee good boys and girls for your parents! There was also a Mr. Don’t Bee to show children exactly what they should not do. Do-Bee balloons were also manufactured. Each balloon featured a painted sketch of Do-Bee on it. When the balloons were inflated and then released, they would fly around the room slowly emitting a buzzing sound. These balloons were made available for purchase to the public. The show used the then-popular Mattel Jack-in-the-box for its opening and closing titles, with its Pop Goes the Weasel theme song. 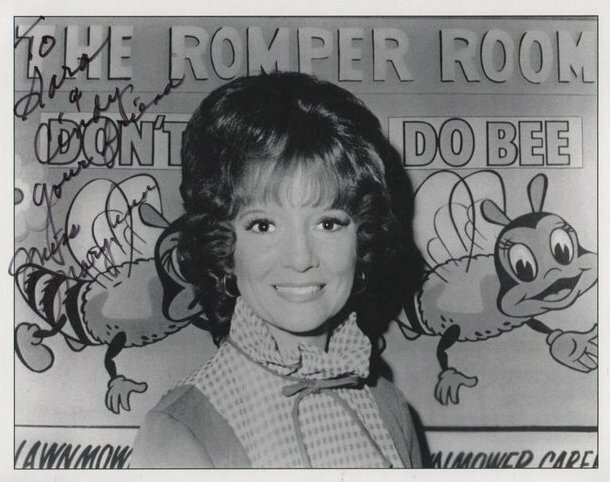 At the end of each broadcast, the hostess would look through a magic mirror – actually an open hoop with a handle, the size and shape of a hand mirror – recite the rhyme, Romper, bomper, stomper boo. Tell me, tell me, tell me, do. Magic Mirror, tell me today, have all my friends had fun at play? She would then name the children she saw in televisionland. Kids were encouraged to mail in their names, which would be read on the air – first names only. This entry was posted on Tuesday, May 7th, 2013 at 7:15 pm	and is filed under Blog by Manny Pacheco. You can follow any comments to this post through the RSS 2.0 feed. Responses are currently closed, but you can trackback from your own site.